Roxanne “Roxy” Scrivener is no stranger to hard work. In high school, she worked two jobs while keeping her grades up and helping care for her younger sister. Roxy’s tight schedule and budget kept her from participating in sports and other activities, so she focused her energy on excelling in school. As an NMC student, Roxy is still working as hard as ever and excelling in school, but one thing has changed—thanks to donors like you, Roxy can finally participate in campus and community activities. 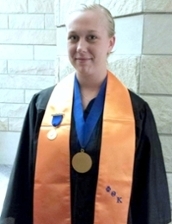 During her time at NMC, Roxy has been an officer in Phi Theta Kappa Honor Society, a big sister with the Big Brother/Big Sister organization, and a competitive disc golf player. “Because of the scholarships I’ve received from the NMC Foundation, I’m able to keep my work hours around 32 hours a week instead of 40. I have more time to be part of campus and the greater community,” Roxy said. Because of support from donors like you, Roxy had time to develop leadership and collaboration skills through her activities outside of the classroom. Her skills did not go unnoticed. Roxy was one of two students nominated to represent NMC on the All USA Community College Academic Team. Thanks to support from generous donors like you, Roxy had plenty of enriching extracurricular activities to include on her All USA application. Her grade point average, campus involvement, and civic engagement made her packet the highest scored in Michigan, earning her the New Century Scholar Award and a $2,000 scholarship from Coca-Cola. Congratulations, Roxy!